Recipes for you to try! Grind dates and 2 Tablespoons of the soaked-date water in a food processor for about 1 minute. Move to another bowl and set aside. Grind cashews and almonds in food processor for 45 seconds – not to flour consistency. Add dates, salt, cinnamon, vanilla and protein powder to food processor. Grind together until well mixed. Should be a couple of minutes. Consistency should be a little sticky. If not, add a bit more of the date water. You want to be able to roll these into balls. Roll the mixture into individual 1-2 inch balls. Grind the ¼ c. almonds and ½ c cashews into a fine powder and roll the balls so they are no longer sticky. ​Greek yogurt is important because of the protein content! Plain is important for “no added sugar”. Full fat is important to lower cholesterol levels and prevent heart disease. Stevia is a sweetener that is naturally low in calories and does not raise your blood sugar level when consumed. Also known as sweetleaf, stevia is made from the Stevia rebaudiana plant, a native of South America. *Note: I use a mix of coconut oil, butter and cacao butter. Cacao butter is the fat extracted from the cacao bean. It smells AMAZING but tastes super rich on its own. I get it online as it’s quite expensive in the shops. If you can find it, I definitely recommend mixing some in with the coconut oil. It WILL take your protein bars to the next level, I guarantee it!! Add to the dry ingredients, and mix around until everything is combined. Have a little taste, and add stevia and/or extra sweetener to reach your desired sweetness levels. If the mixture is really wet, add some extra chia seeds (or almond meal, psyllium husks etc) to thicken it up. If it’s too dry, add some extra coconut oil. Line a small square (about 21 x 21cm) baking pan with baking paper (no need to grease it). Tip the mixture in, press it down and smooth out with the back of a spoon. Pop in the fridge for 30 minutes or so to set. When set and hard enough to cut, lift the whole lot out on to a chopping board. Cut into squares, rectangles, triangles (they will definitely taste better), trapezoids, or maybe even a congruent geometrical double helix? It’s up to you, really. But I highly recommend squares for easy sharing and friend-making. In a large bowl, mash banana and add chia seeds, stir well. Add protein powder, rolled oats, coconut nectar and stir well. Add coconut flakes, sunflower seeds and hemp hearts. Mix until completely combined. Place parchment paper in a bread loaf to line the bottom (making these easy to remove). Place the batter in the bread pan and flatten out into one even layer. Sprinkle with additional coconut flakes and sunflower seeds. Melt the chocolate in the microwave using 30 second intervals (takes about 1 minute to 1 minute 30 seconds). Stir until smooth. Take the bars out of the bread pan and drizzle with melted chocolate (optional). Place in fridge for the chocolate to harden. Cut into 5 slices. 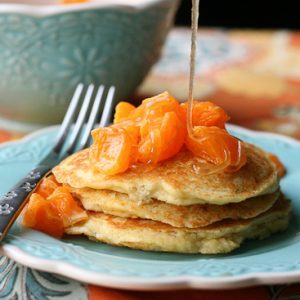 These paleo dreamsicle pancakes are laced with the sweet lemony-orange flavor of Meyer lemons and vanilla beans. It’s like having a dreamsicle for breakfast! Directions:Combine almond flour, coconut flour, baking soda, salt, and the zest from all three lemons in a large bowl. Whisk to combine. In a medium-sized bowl, whisk together the eggs, yogurt, applesauce, juice from TWO of the lemons, and 1 Tablespoon of the vanilla bean paste. Pour the wet ingredients into the dry mixture and stir to combine. Heat a skillet over medium-low heat and brush some coconut oil on the surface. I use a 1/4 cup measuring cup to grab a dollops of pancake batter, place them on the pan, and spread them out a bit. The batter will be thicker than traditional pancake batter, so they need a little help spreading. For best results, cover the pan to allow pancakes to steam while they cook. Cook until the edges look dry and the pancakes are golden brown. Flip and cook on the other side. Keep warm while you continue to cook in batches. To make the compote, combine the clementine pieces, 1 teaspoon of vanilla bean paste, and the juice from the remaining lemon in a small bowl. Serve the compote over the pancakes and drizzle with honey. 1. If you don’t have vanilla bean paste, you can use 1 teaspoon of vanilla extract in the batter and 1/4 teaspoon in the compote. 2. If you can’t find Meyer lemons, substitute one lemon and two clementines (juice and zest). Snack today was organic carrot chips, Organic seedless red grapes and a dip made of plain, whole milk greek yogurt, almond nut butter, cinnamon and Stevia. This created a well-balanced snack of carbs, protein and fats. Blend in a blender. It’s SO good!